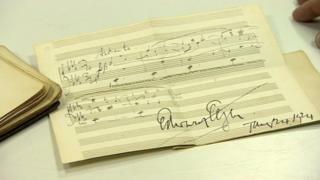 A piece of music signed by Sir Edward Elgar has sold for £5,400 at auction, following its discovery nearly a century after being written. The 1924 manuscript was folded up in an autograph book which includes the signatures of Charlie Chaplin and Sir Winston Churchill. The book was compiled by Barnardo's matron Lydia Tabb, and was found at the back of her wardrobe by a relative. At auction on Tuesday, it was sold to a private buyer in London. The autograph book, being sold as a separate lot, went to a private buyer in the Midlands for £3,600. The book, which also contains signatures from radio inventor Marconi and novelist Rudyard Kipling, had been taken to Barnardo's fundraising functions, auctioneer Richard Winterton said. It had been neglected after the matron, who retired to Gravelly Hill in Birmingham, died in 1983. Ms Tabb's great-niece Linda Brewer, who discovered the book, said her father told her about it "many years ago", but she had not seen it until the middle of last year. She said: "I was looking through mum's photographs, because I was going to do an album. "I found the autograph book at the back of mum's wardrobe." Mr Winterton said "although small", the composer's work was "definitely a new piece". He said that Elgar had possibly composed the piece just for Barnardo's. "They've said 'do you think you can do something?' And he's gone and done this tune. It's fantastic," he said. Elgar was born in 1857 in Broadheath, Worcestershire, and died in 1934. Among his best known work was the Enigma Variations and the Pomp and Circumstance Marches. The sales took place at Richard Winterton Auctioneer's The Library Sale at The Lichfield Auction Centre in Fradley Park on Friday.